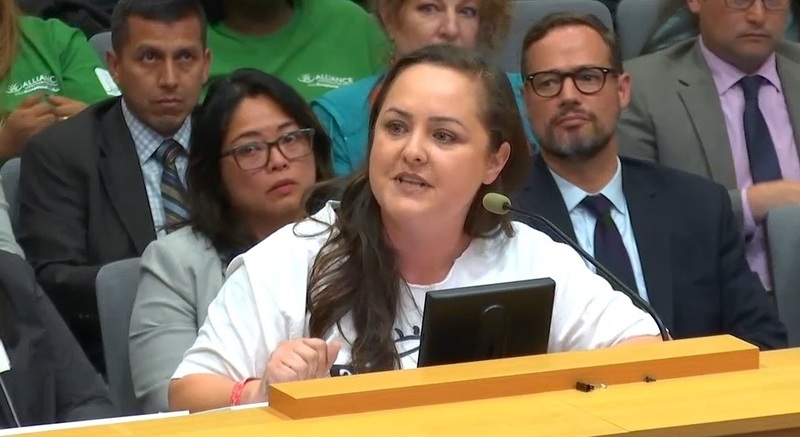 Roxann Nazario asks the LAUSD Board to vote no on a resolution calling for the state to ban new charters for nearly a year. The Board voted yes. At last week’s meeting, board members who supported the moratorium repeatedly said this resolution was “not a ban.” Yet when you look up the word “moratorium” in the dictionary, “ban” is used as a synonym, and vice versa. The message sent to charter school families was that we were overreacting. We were also told over and over again that the moratorium would affect only new charter schools. Let me make this clear, charter school families understand this particular resolution does not affect existing charter schools right away, but that doesn't mean that we are not under attack. Just the fact that this backroom deal was made in the dead of night without any charter school parents or advocates involved creates tremendous distrust. Independent charter schools were not supposed to be bargained as part of the teachers contract at all, which is why the charter community stayed quiet during the strike and negotiations – even though our schools were being verbally assaulted on a daily basis. Even though we tried to stay out of it, and many of us even supported the teachers on the picket line, we were still used as bargaining chips in a deal that many have called illegal — a deal that was signed on the backs of charter students and thousands of students on waiting lists, hoping to get into a high-quality school. Roxann Nazario speaks to a rally of 3,500 parents, students and educators who opposed the charter moratorium. So where does this leave us? It leaves us in a very vulnerable position. Spare me the argument that this is only temporary. Back in 2014, the state temporarily took away API scores, which were supposed to return the following year but never did. That is just one example of why the fear charter school parents have is legitimate. I wouldn't be surprised if there were legislators waiting in Sacramento for the OK to run with this and make it a statewide moratorium. Governor Gavin Newsom and Superintendent Tony Thurmond, whose campaigns were both supported by the teachers unions, have said in the past they support a moratorium. If a moratorium goes into effect, or if the charter killer bill is revived, I will hold this LAUSD board — and my board member, specifically — accountable. I will hold Monica Garcia accountable. I will hold each and every board member accountable except for Nick Melvoin. Now that LAUSD is calling on the state to conduct a study on the impact of charters, I’m also wondering: Who is going to conduct this study? Neutral, third-party researchers or lobbyists for the teachers union? I do not trust that the current state Board of Education and elected officials in Sacramento have the best interests of families and my right to choose in mind. Given how politicized this has become, the heightened concern of charter parents is justified. This is not the first time our schools have been under attack, and I’m sure it won’t be the last. Parents need to watch what happens at the state level carefully and contact your state lawmakers by clicking here to tell them to vote against any charter ban. And join me March 13 at the state capitol to rally for more funding for public education and against any charter moratorium or charter killer bills. I do not want to leave you thinking that there is no light at the end of tunnel because I always believe there is. I have made a point to take a personal interest in the school board special election that is taking place in Board District 5 on March 5. Even though we may not live in BD5, we still all need to get involved. Whoever is elected will have a vote and a say in our children’s education. Not to mention that this is a swing seat, and the candidate that is elected could take the board in an anti-school choice direction. If this so-called “pro-charter” board voted for a charter moratorium, imagine how much worse it can get. If you would like to find a way to get involved and learn more about the candidates and where they stand on school choice and other issues, check out Speak UP’s Election Watch page. And then go knock on doors and make phone calls for your favorite candidate. I know I will.